Sunny skies with gusty winds developing later in the day. High 63F. Winds NW at 20 to 30 mph. Higher wind gusts possible.. Partly cloudy skies early will become overcast later during the night. Low 44F. NW winds shifting to ESE at 10 to 15 mph. Why was student nominated? "Jizzelle always goes the extra mile to make everyone at Hoover feel welcome and appreciated," said Scott Schalk, school counselor. "She has a great sense of humor and brings enjoyment to my counseling lessons whenever I come to the room. Jizzelle always wears a welcoming smile and goes out of her way to make others feel appreciated and accepted. 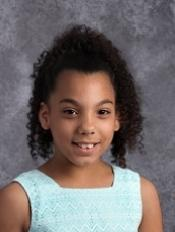 I will certainly miss Jizzelle when she moves on to middle school, but am excited to see and hear about all the great things she will accomplish!" What are you most proud of? "I am proud of how I’ve grown as a person! I have gotten much better at understanding math especially greater than and less than. I am also proud of my artwork. It has gotten me through some tough times." What makes you happy? "My friends! Especially Annabelle. Hi Annabelle! Also drawing, it helps me calm down. I am also happy when I am thinking about 'the now' instead of the future and living in the moment." What teacher has inspired you and why? "Mrs. Wood (my fifth grade teacher) because she really pushes us to be our best and makes me try really hard. Social Studies used to be the worst thing ever but Mrs. Wood taught it in a way that I really enjoy it!" What is your reaction to honor? "Kind of surprising because they could have picked anyone and they picked me! I am happy because it is a great way to end my year and go into Middle School."